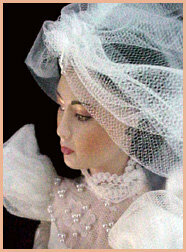 Designer Hanae Mori Exquisite Bride! 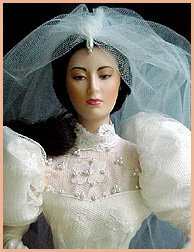 Bride Doll by Haute Couture designer Hanae Mori for the Franklin Mint! A totally sold out limited edition, no longer available! 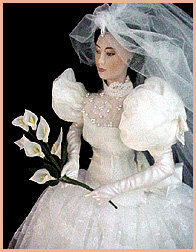 14� porcelain, white satin fitted drop waist bridal gown with lace applique� with heavy pearl trim, silk underskirt, pantaloons trimmed in lace, long net veil with pearl drop. 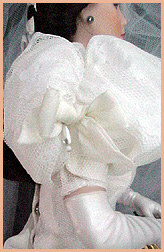 The puff sleeves are accented with white silk bows and a pearl drop as well, and a large silk bow is in the back of the dropped waist. The bows will probably have to be steamed as they are well packed in the boxes. 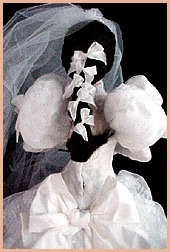 She has Long black hair in a thick french braid with silk bows. 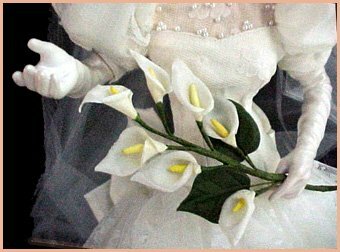 She carries a fabulous bouquet of Calla Lilies. 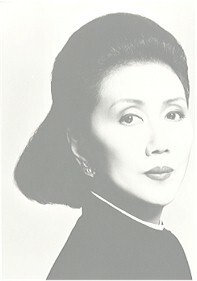 She is Asian with beautiful brown eyes. She has never been removed from her box! 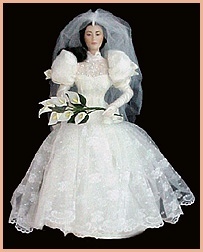 Don't be fooled by purchasing another collector's display doll, this is pristine and new from gallery stock! 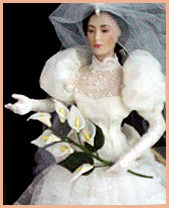 Issue price $245.00 and sure to be a fine collectible treasured heirloom. 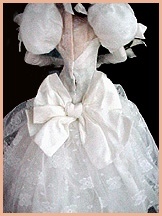 SALE PRICE $169.00! She will Ship Priority Mail Insured USA for $11. 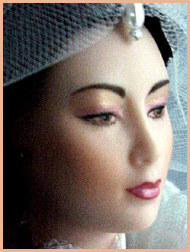 Our of USA please e-mail zip code and country for postage quote. 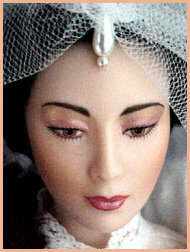 All photos copyright Mann Gallery. Do Form to Order or to send us E-Mail! We also accept PayPal and American Express!